After a cold and windy winter, your outside space is probably looking a little shabby so install some beautiful floor tiles to perk up your patio and to add instant appeal to any property. In the last decade, Bi-fold doors have become an increasingly popular way to enhance outside space and to visually extend the living area. To compliment this, designers are turning to flooring that looks beautiful inside and out to achieve both a stylish interior and an inviting patio area. It makes sense to create a seamless transition between the interior and the exterior of a property, as this leads the eye outside, making the interior space appear larger, and offering a greater sense of flow throughout the property and beyond. 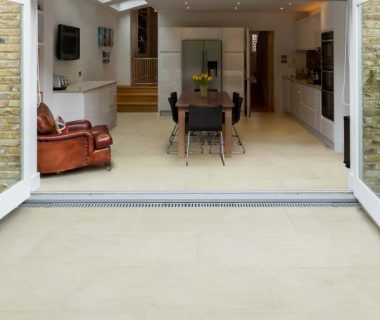 We’ve chosen a selection of lovely limestone tiles that will create a space that is as stunning on the outside as it is on the inside. 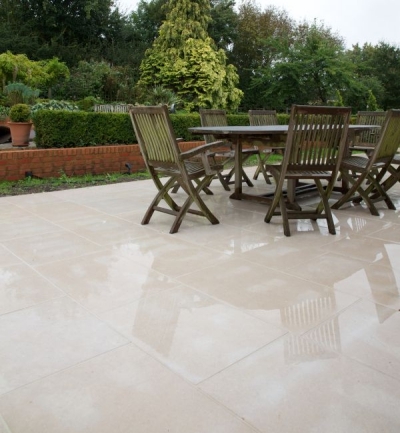 Our Buscot Limestone Etched is a creamy smooth stone that will not fail to impress. These bleached-effect flagstones are perfect for creating an inviting garden patio area. 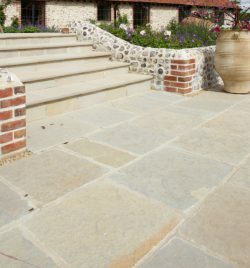 The cool, creamy-grey tones of the Wychwood Limestone Tumbled and Etched is another beautiful stone that is perfect for inside the home and out in the garden. Its etched finish also makes it perfect as a non-slip pool surround. Trusloe Limestone Seasoned Finish tile, with its variations in grey and beige tones bring a rich and rustic finish to a pastoral setting, both inside and out. With thoughtful planning, you can extend your space to create an outside room. Whether you have a bijou balcony to work with or a county-sized garden. Whether you are looking for rurally rustic or city sleek – gorgeous tiled flooring can make the most of any outside space.